What Is the Average Height of an Electrical Outlet in a Basement? When installing any type of electrical wiring, you have to pay attention to the rules established by the National Electrical Code, but when it comes to minimum receptacle height requirements for electrical outlets, the NEC is silent. That doesn't necessarily mean you can place the outlets anywhere because local jurisdictions may have established rules that you must follow. It's always a good idea to check with the local building department before doing any electrical work. Even though there isn't a minimum height requirement, electricians do adhere to a standard when installing electrical receptacles. This standard height is 16 to 18 inches from the center of the outlet to the floor. Electricians often measure this using a 16-ounce claw hammer, placing the face of the hammer on the floor and making a mark at the tip of the claw. Some outlets may need to be lower to accommodate particular fixtures, such as a freezer or baseboard heater. There is no NEC regulation that prohibits this, but local codes might. For example, section 1136A of the California Building Code specifies that the minimum height of an outlet be 15 inches from the bottom of the electrical box to the floor. You can meet this requirement by using the hammer method to measure height as long as the bottom of the box is above the tip of the hammer claw. The NEC spacing requirement for outlets establishes a maximum height. 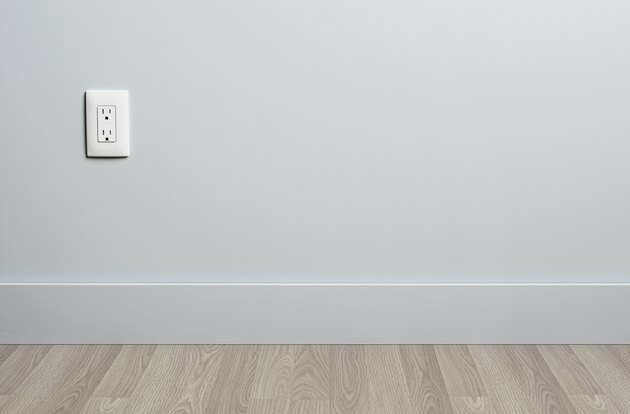 Every part of the wall must be within 6 feet of an outlet, so that's the maximum height you can place an outlet above the floor unless there is another one within 6 feet of it. Because of the possibility of moisture, it makes sense to treat outlets in an unfinished basement as you would treat outdoor outlets. The NEC has no requirements for minimum height for these outlets either, but you want to place them high enough to keep them dry. The NEC does specify a maximum height for outdoor outlets. It is 6 1/2 feet above grade. You should follow this requirement in an unfinished basement even if another outlet is within 6 feet of the one you're installing. The Americans with Disabilities Act establishes minimum and maximum heights for outlets, and you may want to adhere to ADA guidelines when wiring a finished basement. The minimum height is 15 inches from the bottom of the receptacle box to the floor, and the maximum height is 48 inches. The ADA also establishes guidelines for the placement of outlets above counters and in other places that are hard to reach for people confined to wheelchairs. Some states, such as California, have established the ADA guidelines as electrical code outlet height requirements. The NEC may not specify a minimum outlet height in the basement, but it does specify that ground fault circuit interrupting, or GFCI, outlets are required. These outlets have an internal breaker that trips when it detects a current surge that could happen when someone touches a live outlet or an exposed wire in a defective tool or appliance. GFCIs are required in other parts of the house as well, including bathrooms, kitchens, laundry rooms and outdoors. You may be able to avoid having to replace all the outlets in the basement with GFCIs if you replace the breaker for the basement circuit with a GFCI breaker, but it's best to check with the local building department first.